Making yogurt without a machine is very easy if you accept a slight degree of unpredictability, as yogurt cultures can be temperamental. The tricky part is keeping the yogurt at the right temperature while it sets, and this is where a yogurt maker helps, but it’s by no means indispensable (I don’t own one and I have been making yogurt for years). 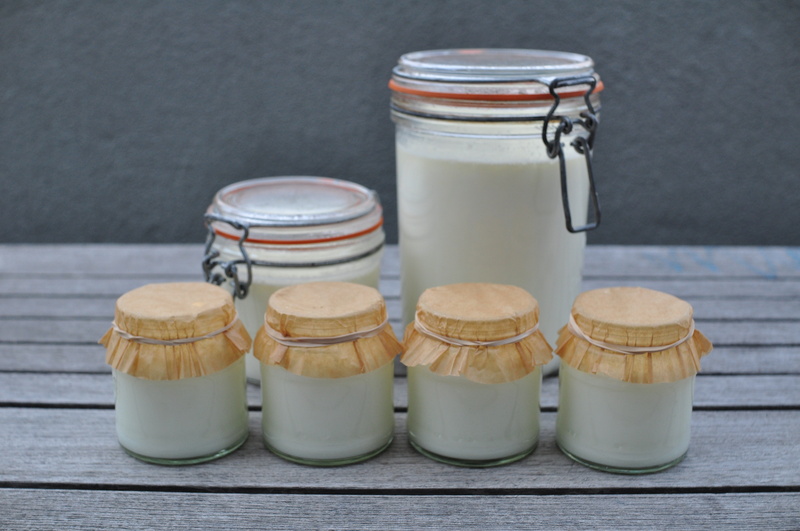 Like many people interested in making yogurt at home, I knew it was easy – theoretically. But it wasn’t until I witnessed it that I realized how ridiculously simple it really is. The main steps are very straightforward: heat milk – let cool – stir in a spoonful yogurt – let set; but of course, the devil is in details. In a saucepan, heat milk until bubbles begin to form. Remove from heat. Yogurt cultures are most active just above body temperature, at 110°F (43°C). A good way to gauge the temperature without a thermometer (I don’t own one, either) is to place your little finger in the milk and count to 10. It should feel warm but not burn. If the milk is too hot it will kill the yogurt cultures. If it is too cold the yogurt will take forever to set or not set at all. Any commercial plain yogurt works, as long as it contains live cultures (specified in the ingredients). Using more “starter” yogurt will not help, on the contrary. Think of it as overcrowding; too many live cultures make the yogurt thinner and more sour. Stir well so the starter yogurt dissolves into the milk. Any container will do, large or small, jar, bowl, storage container, etc. Preheat container(s) with hot water to maintain as much heat as possible. Cover with lid, cloth, or parchment paper (this makes a difference; left uncovered the yogurt doesn’t set as well). Yogurt keeps in the refrigerator for weeks. This entry was posted on 29 September 2010 at 08:23 and is filed under Basic, Breakfast, Homemade and preserves, Year-round. You can follow any responses to this entry through the RSS 2.0 feed. You can skip to the end and leave a response. Pinging is currently not allowed. I live in Egypt where houses are very badly insulated. In summer, I just leave it on the balcony or in the kitchen and it is ready in a few hours. Winter is a different problem. No central heating means that you cannot leave it in the airing cupboard or any warm spot (radiator, hot water pipes) as there aren’t any. I dare not put it in my bed covers as I have forgotten about it before and jumped into bed…yoghurt everywhere… and, if like mine, your oven is old and not well insulated, you will find the temperature lowers too soon. So I now place my yoghurt pot in a pan filled with boiling water. Water cools down quite slowly. I might have to refill with boiling water half way through. So far, it’s been the best system I found, short of buying a thermos container. Oh! and incidentally, I get buffalo milk here and get the smoothest, most unctuous, thickest yoghurt you can imagine! So thick you can actually cut it with a knife! 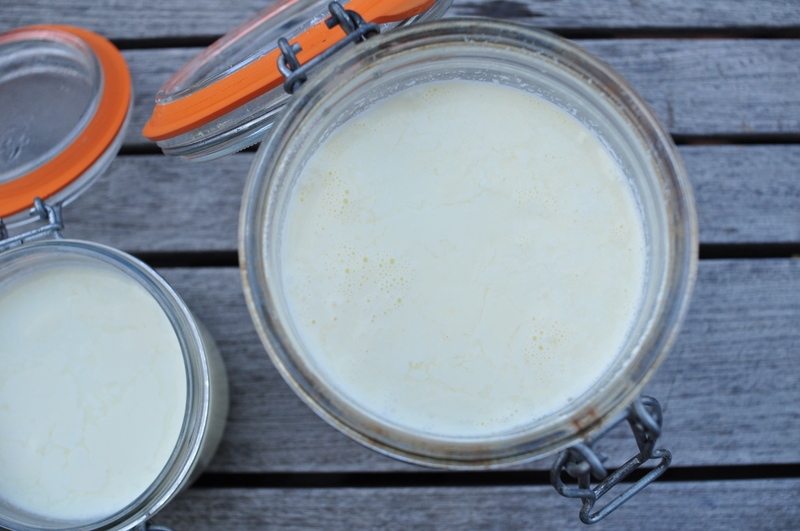 Buffalo milk yogurt – yum! I’ve bought it here and it was indeed super thick, but I’ve never found buffalo milk to make yogurt myself. Is the thickness due to the higher fat content in buffalo milk? Last time I added cream to the (regular cow) milk when making yogurt. It was thicker and more unctuous… And thanks for yet another method on how to keep the yogurt warm while the cultures multiply. It compares with cow, sheep and goat. Buffalo has more fat, and calcium, and it has less water and cholesterol than cow, goat and sheep. It also has more protein, lactose, carbs than cow and sheep but less than goat. My guess it’s the calcium and fat combined that really makes the difference. That’s what it has more of than sheep, which is already thick and creamy. Another place to put your “yogurt in the making” is under your bed covers! I remember years ago friends of ours doing just that. You musn’t of course have children who love to jump on your bed!